The doctor Watanabe small left who lived in (1806) Dofuchi-mura (Matsuyamamachi) in 1806. Bathhouse overlooking seasonal Shonai plains from 100m above sea level is attractive . Accommodation where Mt. Ide and shore are seen. It is on the foot Shirakawa shore side of Ide Mountain Range. Is flowing constantly from the source, of strong acid-related sulfurous spring and weak alkali mineral spring, for each three men and women. We are proud of history of hot spring castle town open hot water more than 560 years to look good with wine and yukata. It is located along the main street of the Zao Hot Springs center, and slope and ropeway are immediate, too. It is near the distribution center of hot spring Yamagata-shi that sprang out in quiet residential area. There is public bath of providing equipment one of the foot of Tatsuyama hot spring group one-day rest, person of neighboring villages. The bank of clear stream Iragawa, one accommodation in quiet among the mountains Of clear stream Iragawa. Japan which is one-day spa facility located in the halfway up a mountain which was below some Zao Hot Springs. Sound soshitesubeteohogu of the murmuring to be fragrant, and to whisper green dazzle to of flower. Both body and heart are refreshed Mogami River sailor's song that wants to spend hot water kkuri all day long. Nestle in quiet plot that deviated from bustle of Higashine-shi, Yamagata center; "top horn. Of three is flowing constantly from the source! It is popular one-day spa facility. In each man and woman. Day trip bath facility which Route 13 is along, and can go by car casually. The amount of of new one-day spa facility ceiling having just finished opening in 2010. 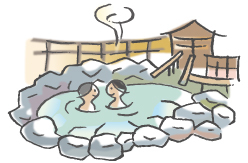 Kaminoyama Hot Spring has five places of public bathhouses, fair skin toattamarino hot water.